We usually associate cavities more with children than adults. But changes that occur with aging can make cavities referred to as “root caries” an adult problem as well. Gum disease, brushing improperly or with too hard a toothbrush and some age-related gum changes can cause our gums to recede. When that happens, the roots of the tooth become exposed. Covered with a tissue called cementum that is softer than enamel, tooth roots are susceptible to decay and sensitive to touch, heat and cold. 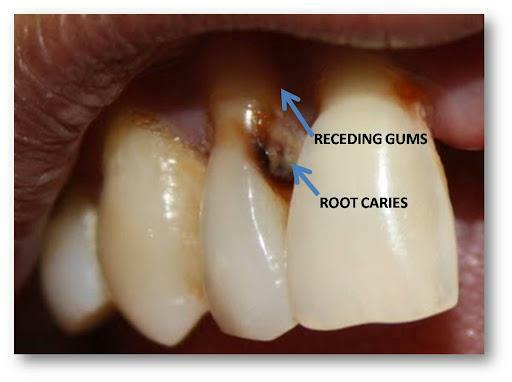 Root caries is a cavity that forms on the roots of your teeth when tooth roots become exposed to plaque due to receding gums. A dental cavity on the root of the tooth has more chances of affecting the pulp, so it’s important to treat root decay before it has a chance to spread. It’s not unusual for people over age 50 to have tooth-root decay. While dentists treat root decay the same way they treat regular dental cavities, root fillings have a much higher failure rate. Tooth filling material isn’t designed to adhere to the tooth’s porous roots, often resulting in a shorter life span for the restoration and multiple visits to the dentist to fix the problem. Severe damage or decay found between teeth could require a dental crown or a tooth extraction followed by a dental bridge or dental implants to replace the tooth. Root decay also increases your chances of needing a root canal. As more baby boomers are becoming seniors, the dental industry is finding new ways to battle root decay. At Angell’s Dentistry, Dr. Angell might recommend in-office professional fluoride treatments as well toothpaste, mouth rinse or fluoride trays you can use at home as part of your ongoing dental care. For receding gums, an ultrasonic dental cleaning can remove dental tartar from under the gum line and help ward off the possibility of gum disease. If necessary, a gum graft can help restore gums to their natural state. At home, soft brushing with fluoride toothpaste will also help keep your gums intact and prevent decay. If you’re concerned about receding gums and root decay, Dr. Douglas Angell and the dental hygienists at Angell’s Dentistry will be happy to answer your questions. Angell’s Dentistry is committed to providing each of our patients with a beautiful, healthy smile and unmatched dental care. We invite you to visit our website at: www.angellsdentistry.com. This entry was posted in adult dental care, Angell's Dentistry, caries, Dr. Douglas Angell, find a dentist Birmingham MI, find a dentist Michigan, find a dentist Troy MI, Michigan dentists, receding gums, root caries, sensitive teeth, tooth root decay, www.angellsdentistry.com. Bookmark the permalink.